When Dr. Hess Green (Duane Jones) is attacked and stabbed with an ancient African dagger by his unstable assistant, he discovers he's developed an unflinching addiction to imbibing blood. But his assistant's wife, Ganja Meda (Marlene Clark) arrives in town in search of her missing husband, and the two begin an affair that makes for a complicated journey involving lust, companionship, and dependency. 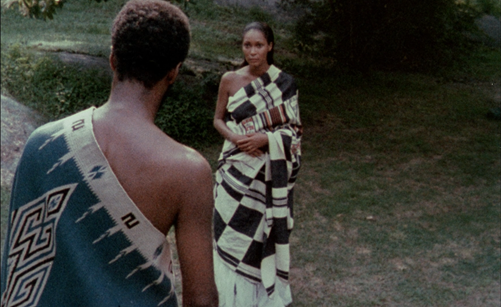 Ganja & Hess (1973) is such a feast for the senses that it almost cannot be reflected upon linearly. It relies on visuals, sound, and mood. It is a coherent sequence of moments. We are intimate with the characters and space that surround them. Ganja & Hess, for this very reason, doesn't come with a set of instructions. It is up to the viewer to map a path that suits their understanding. What writer/director Bill Gunn (who plays Dr. Hess' assistant) wanted was a disruption of mainstream fare. Gunn didn't seem too interested in what Hollywood desired, and like many writers, wrote a screenplay that felt personal and needed to be written. It tackles so many themes, it's almost difficult to begin. While most rely on it being vampiric and about addiction, it's important to note the journey that Hess and Ganja embark on together. Their romantic entanglement may by one of the most fascinating aspects of the film that is commonly overlooked because it is challenging to simplify. Unapologetic and abrasive, Ganja initially shields herself from Hess. After the patient doctor implies her husband has "disappeared," he grants her request to stay at his house for a few days. Upon meeting in his driveway, she steps out of the car, a long shot revealing their pregnant stare off. Mistaking Hess for 'the help,' she manages to conjure only a grain of private humility to save face, continuing to make demands. Whether it be guilt or stark loneliness, Hess lets her transgressions slide. Both are looking for something. Despite non-apologies, marital commitment, and (accidental) deaths; Ganja and Hess seek not only sexual, but emotional dependency intimacy with each other. Ganja's exterior unravels after discovering the body of her dead husband in Hess' cellar. After an awkward confrontation, she laments about a moment in her childhood when she realized her mother would never look upon her with innocence. Even as a child, she was a "disease". It was a turning point for Ganja when she realized that love seemed elusive. The connection to an earlier conversation she has with Hess asking what she wanted and her immediate and emphatic response being simply, "money," is interesting to examine in contrast. Ganja desperately wants to heal that memory, and seeks to do so with vain acquisitions. Beneath, she wishes she had the freedom of innocence, to be a child that transitioned into adulthood, loathing its premature presence. Since growing old often marks itself with life experiences that tend to make us a tad jaded, cautious, and turned "off," Ganja comes on strong with these qualities from the very moment we're introduced to her. Her revelation to Hess, cracks a bit of our understanding of her, showing us that her real need lies within what she hopes Hess can offer. Juxtaposing this revealing monologue scene is a moment where Ganja and Hess share an innocent chase plagued with laughter, fun, and a delightful 1970's soundtrack. Ganja taking agency in her narrative, simply enjoying being. Not as a person who is inherently broken or a "disease," and maybe with Hess, side by side with a kindred spirit, no longer alone. Making it official, they marry. Traditional white and formal attire, "assembled in the presence of God," shortly after Hess looks upon Ganja, wanting her to live forever with him, to share his "curse" to assuage his fear of isolation once more. Another ceremony ensues. One where Hess uses the dagger involuntarily afflicted on him to pierce Ganja's voluntary flesh. The two ceremonies representing the vast understandings of duality that can be very black and white, but also relay a sub-foundation of gray matters that inform our own attitudes toward tradition, religion, sexuality, race, even love. Throughout, they are frighteningly authentic, rude, indirect, communicating verbally only in codes of "I'm sorry's" and "I want to learn to love you's," not approaching matrimony with any perfection of resolve, but a leap of faith. While the rest of the film reveals Ganja and Hess creating their own traditions together, it concludes with no easy explanations. Furthering our muddled concepts of human behavior. Nothing "makes sense" yet personally, despair sets in as Ganja & Hess is made very clear in the final scenes. Their exchanges are truly a feast for the senses and just because their romantic entanglement is rationally finite, doesn't mean it lacks merit for more exploration when the credits roll.